starting its new campaign for the 2018 World Cup Russia after gaining the support of the Japan Foundation Asia Center. Born in Gifu 1958. Completed graduate school at the Tokyo University of the Arts. 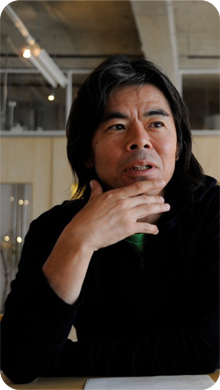 Gained recognition in the 1980s with his cardboard artwork, and won the Third Japan Graphic Exhibition Award. In recent years has worked on projects involving local communities developing projects by drawing on the strength of participants. Major projects include Day After Tomorrow Newspaper Cultural Department (2003~), Day After Tomorrow Morning Glory (2006~), Asia Daihyo Japan (2007~), The Seed is a Ship (2007), Seabed Exploration Museum Ship (2010~), and in the same year commenced the MATCH FLAG PROJECT. Worked as the general producer of the National Sports Festival Gifu Seiryu Kokutai and the National Sports Festival for People with Disabilities Gifu Seiryu (2012), Artistic Director of the Roppongi Art Night (2013-15). Directed the Joint Exhibition Nippon Foundation Collection de l’art brut “”TURN/From the Land to the Sea (Human’s Original Power”. Currently trustee of the Tokyo Council for the Arts, Curator of the Museum of Fine Arts, Gifu. The ASIA DAIHYO project is active in realizing its theme of fusing “art” and “sport”. The ASIA DAIHYO Nihon Organizing Committee is a group which has promoted the project three times previously, coinciding with the 2006, 2010 and 2014 Football World Cups. The headquarters of the organization are in Dazaifu, Fukuoka Prefecture, and is developing its activities for the ASIA DAIHYO project with the many groups and citizen volunteers primarily in Kyushu. The Japan Foundation is Japan’s sole organization dedicated to carrying out comprehensive international and cultural programs throughout the world. In 2014 the Foundation established the Asia Center, which aims to build ties among the peoples of the region, expand networks and build up Asian culture together. As the 2020 Tokyo Olympic and Paralympic Games approaches, the Center will hold a number of events in fields such as music, performing arts, cinema, art and sport while supporting exchange activities among Asian people. The Asia Center is a co-sponsor of the ASIA DAIHYO Project commencing in 2015 and will make every effort to turn it into an exciting event.